Mongolia is located in northern Asia. Mongolia is bordered by China to the south, east, and west, and Russia to the north. Google Earth is a free program from Google that allows you to explore satellite images showing the cities and landscapes of Mongolia and all of Asia in fantastic detail. It works on your desktop computer, tablet, or mobile phone. The images in many areas are detailed enough that you can see houses, vehicles and even people on a city street. Google Earth is free and easy-to-use. Mongolia is one of nearly 200 countries illustrated on our Blue Ocean Laminated Map of the World. This map shows a combination of political and physical features. It includes country boundaries, major cities, major mountains in shaded relief, ocean depth in blue color gradient, along with many other features. This is a great map for students, schools, offices and anywhere that a nice map of the world is needed for education, display or decor. 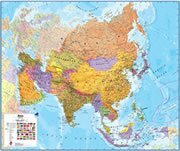 If you are interested in Mongolia and the geography of Asia our large laminated map of Asia might be just what you need. It is a large political map of Asia that also shows many of the continent's physical features in color or shaded relief. Major lakes, rivers,cities, roads, country boundaries, coastlines and surrounding islands are all shown on the map. Altay, Arbayheer, Bayan, Bayanhongor, Bayshint, Bugat, Bulgan, Buyant-Uhaa, Choybaisan, Darhan, Dund-Us, Erdenet, Hatgal, Hongor, Jargalant, Moron, Olgiy, Onon, Ovoot, Suhbaatar, Tseel, Tsetserleg, Ulaanbaatar (Ulan Bator), Ulaangom, Urdgol and Zakamensk. 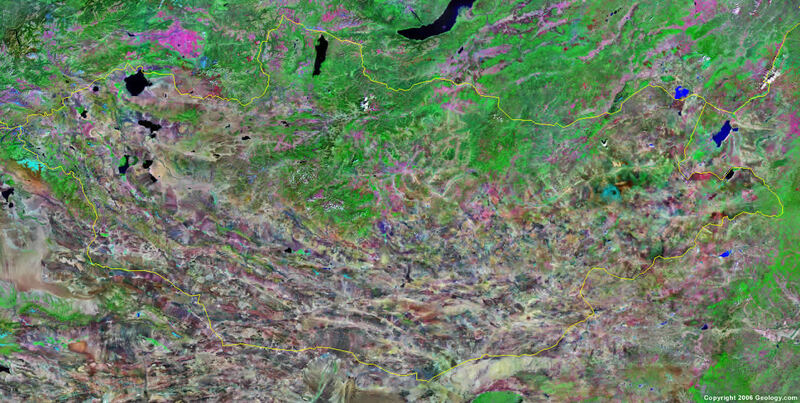 Altay Mountains, Boonstagaan Nuur Lake, Buyr Nuur Lake, Dzavhan River, Gobi Desert, Gurvan Sayhan Uul Mountain Range, Hangayn Nuruu Mountains, Har Nuur Lake, Har Us Nuur Lake, Herlen (Kerulen River), Hovsgol Nuur Lake, Hyargas Nuur Lake, Orhon River, Orog Nuur Lake, Sangiyn Dalay Nuur Lake, Selenge River, Telmen Nuur Lake and Uvs Nuur Lake. Mongolia has fossil fuel deposits which include oil and coal. There is a large number of metal resources some of which are copper, molybdenum, tungsten, gold, silver, iron, tin, nickel and zinc. Other resources for this country include phosphates and fluorspar. Mongolia has natural hazards such as grassland and forest fires. Others occurrences include drought, dust storms, and "dzud", which is the country's harsh winter conditions. There are a number of environmental issues in the country of Mongolia. The policies of the former Communist regime promoted rapid urbanization and industrial growth which had negative effects on the environment. Due to the lack of enforced environmental laws, the air in Ulaanbaatar is severely polluted from the burning of soft coal in power plants. The land issues include deforestation, overgrazing, soil erosion, and desertification. The action of converting virgin land for agricultural production has increased the erosion from wind and rain. Mining activities have also had a deleterious effect on the environment. In some areas of Mongolia there are limited natural fresh water resources.